This is the second project I’ve had to rip out, albeit for a different reason, in a month (the other I also put away until I could bear to undo all my work). Well, I usually find that I like a basic shape of a pattern/garment but don’t like the color, or the construction, or whatever. So…I think I’ll keep the basic shape of this sweater but I’m going to drastically alter the stitch patterns for the panels. 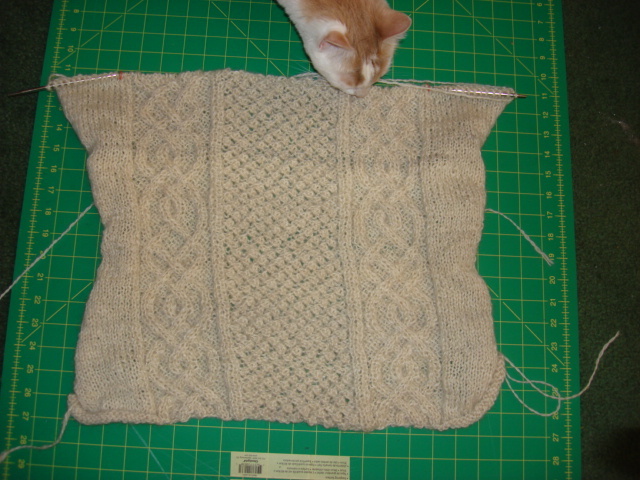 The stocking stitch edges and shape will probably be the only recognizable vestiges of the pattern when I’m done. Since I’m knitting almost exclusively with my home spun right now, I’m thinking I might just need to take a knit design course over the summer (if I can find one) so that I can start designing patterns for my stuff. Working with commercial patterns that I have to alter is already part of my tool kit, so to speak; making my own patterns I suppose is the next step. HOLY MOTHER OF GOD I HATE RIPPING OUT KNITTING!!!!!! I JUST WANT TO DO IT RIGHT THE FIRST TIME!!!! ← Half. com. What a ripoff.